In 1980, about 6 million Hispanic children were in the U.S. By 2008, there were about 16 million. As Figure 2 shows, the strong growth in the number of Hispanic children since 1980 has been accompanied by important compositional changes in their generational status. In 1980, a majority of Hispanic children were third generation or higher. As a result of the large immigrant inflows of young Hispanic adults in the 1980s and 1990s, the number of Hispanic children of immigrant parentage sharply increased. The number of second-generation Hispanic children in particular has markedly grown. The size of the Hispanic child second-generation population more than quadrupled from 1980 to 2007 (Figure 3), and the share of children who are second generation rose from 30% in 1980 to 52% by 2007. Although the number of Hispanic children who are themselves immigrants has grown and is projected to continue to do so until at least 2025, the share of Hispanic children who are immigrants already appears to have peaked around 2000 at about 15% of Hispanic children. Based on population projections of Pew Hispanic Center senior demographer Jeffrey S. Passel, the share of Hispanic children who are second generation—currently 52%—will soon peak at about 53%. This reflects the fact that the large Hispanic second generation born since 1990 is maturing. As they age into their 20s and 30s and form families, they will produce a growing third-generation Hispanic child population. Indeed, the projections suggest that after reaching its nadir at 35% around 2015, the share of Hispanic children who are third generation or higher will begin increasing. From 2010 to 2025, the Hispanic child second-generation population is projected to grow by 33%. 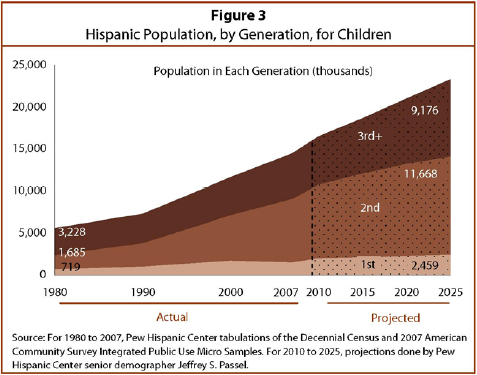 Meanwhile, the Hispanic child population in the third generation or higher is projected to grow by more than 60%. This generational profile for Hispanic children differs from that of the entire Hispanic population. While the share of Hispanic children who are second generation may soon peak, the share of the entire Hispanic population that is born in the U.S. to at least one immigrant parent has not peaked. Demographic projections suggest that among the entire Hispanic population, the second-generation share will not peak until at least 2050 (Passel and Cohn, 2008).